If in doubt, pick up a Beverley – I think I should adopt that as a motto! But after reading the wonderful “Miss Buncle” I didn’t really fancy anything too heavy, and I want to save (and savour) the second Buncle book! 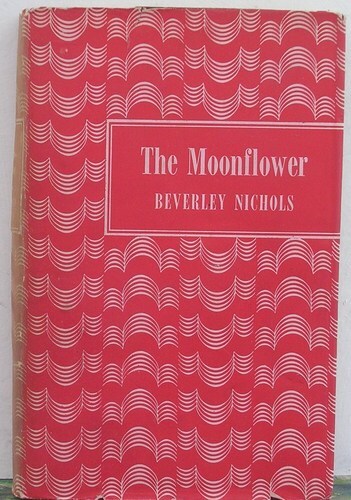 So I turned to the second of Beverley Nichols’ crime novels, featuring his detective Horatio Green – “The Moonflower”. Some of Nichols’ mysteries are harder to find than others, and my copy is a slightly tatty book club edition from 1956 – although it does have something of a dustjacket! However, that doesn’t matter as the story is the thing, and Nichols creates a wonderful atmosphere from the very beginning. The Moonflower of the title is a rare tropical plant, much coveted by flower-fanciers, and seeds have been brought back from a dangerous expedition by the explorer Hilary Scole, at the behest of Mrs. Faversham. Mrs. F is a nasty, rich old widow who lives in Candle Court near Dartmoor, and as the Moonflower comes close to flowering there are a number of people gathered at the house: Mrs. F and Scole, plus son Kenneth Faversham and his wife Beryl; Mrs. F’s companion Sandra Waller; Pusey the lawyer plus the servants, gardeners etc. And staying at the local inn is one Horatio Green; having done a favour for Mrs. F in the past, he has been allowed down to see the Moonflower bloom. Add into the mix an escaped prisoner from Princetown prison on the moors, the drunken wife of Mrs. F’s gardener, the constant sound of the nearby falls and the glowering weather and you’ve got all the ingredients of a great thriller! I’m not revealing much if I say Mrs. F is murdered, because it’s kind of obvious that she’s going to be the victim – such a nasty person sets herself up for the role of corpse from the beginning of the book! However, just about everyone in the house is a potential suspect and despite the theft of her jewels and the legatees of the Will, it isn’t actually obvious who murdered Mrs. F! 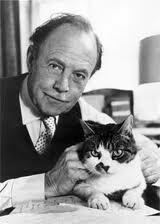 Beverley and a cat – very much in Horatio Green mode! This was actually *such* a good murder mystery! I confess I had no idea who the murder was until the solution was revealed (though I *was* suspicious of one character whose alibi was just too good!) However, the twists and the turns of the plot were excellent, and the lovely repartee between Green and his friend from Scotland Yard, Waller, was a delight. This was a much more accomplished book than the first; the characterisations and plotting just seemed better, Green was very appealing and believable, and of course there is always Beverley’s writing – which is elegant, witty, readable and enjoyable. The denouement is satisfying, reached after a lot of sleuthing, with poor Waller having to send men on strange quests for Green while he has no idea what that man is up to! There was a point at the end where I had a slight moment of discomfort, as part of the solution involves people with Anglo-Indian backgrounds, and the terminology used is not what we would apply nowadays toward people of mixed race origin. However, these negative aspects came from negative characters, and Green (and hence Nichols) displays nothing but kindness and consideration towards the young person concerned. The dust-wrapper of the book proclaims its virtues, putting Nichols and his creation up with Christie, Sayers et al. While I wouldn’t go that far, despite my obvious bias towards any Beverley book I would say that his definitely one of the most satisfying classic crime books I’ve read in a while – and I shall look forward to spending more time in the company of Horatio Green! I love your enthusiasm for Nichols’ work. It’s so contagious!! I’ve been meaning to pick up one of his and with others (and your) recommending it, his name keeps inching up the TBR pile…. Sounds like fun! 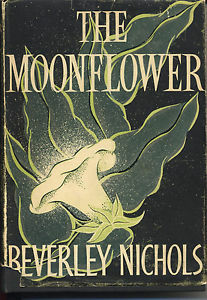 I go through mystery stages, and one of his books may show up someday… I love the idea of the moonflower’s blooming. The Moonflower blooming was actually a relevant part of the plot! I hope you find some of his mysteries – I think they’e lovely! I can see I’m going to have to get into these Beverly Nichols murder mysteries. 🙂 They’re a good read! This sounds great – we need to get it back into print somehow! I see that some of his other works are appearing for Kindle now, so I cross my fingers! (Though physically they looks such handsome volumes, I’d perhaps want one in my hand). Hmmm – I’m a fan of tree books, obviously! And his volumes often have such lovely illustrations. I just hope a reprint publisher will do his crime books justice one day!